Armed with an education (optometry) and real estate skills, Friedman often moonlighted as an inventor: tinkering around with ideas to try and make things better. What happened next is what’s probably happened more than once and probably a billion times to an inventor. 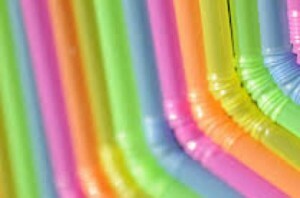 What sets Friedman apart from the idea challenged is that he took the straw home and began tinkering with it. 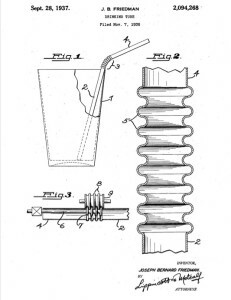 By inserting a screw, and using dental floss, he “impressed the grooves into the straw and handed it back” [to his daughter] and the world’s first bendable straw was created. And, we all know, nothing does. Friedman’s invention was no exception. Applicant has met a problem long existing in the art. A view of any soda fountain on a hot day, with the glasses showing innumerable limp and broken straws drooping over the edges thereof, will immediately show that this problem has long existed. Where we have the conditions where certainly the straw is old, where corrugated tubing is old, and where no inventor, during those years, has seen fit or has been able to solve this problem, whereas applicant did, that situation alone is prima facie evidence of invention.